PL: What gave you the original idea for the Blade Hunt chronicles? I know it started as a short story that required more thanks to your interview with Kim Briggs, but what gave you the short story idea and what inspired you to take it the direction you did? JSM: The short story was about a group of girls on a survival-style camping trip who have a run-in with a demon who picks them off one by one (with a plot twist, of course, because I love a good plot twist). At the time, I was taking a break from a longer project, and thought I'd try the old saying 'write what you know'. Not that I've met many serial-killing demons! (Or have I?...) But I did grow up camping in the Brazilian jungle, so there's that. And the jungle can get creepy sometimes, especially when all the chirping and cheeping critters go silent all at once! JSM: 'Draw inspiration from' sounds a lot fancier, so we'll go with that. To be honest, part of it was how charmed I was — and still am — by Connecticut. When we moved here in 2013, I expected endless miles of suburbia, not woodlands, rivers, and gently rolling hills all over the place. It just felt right, setting a story here. And it's definitely easier when I can drive over and check I got the highway turnoff right for a certain scene, or use my own memory of specific places I've visited. PL: A lot of America is a lot more charming than people anticipate, particularly in New England. So from local inspiration to other forms of inspiration - why demons? JSM: I'm actually not sure! I'd just finished a SF-ish novel about super genes (which I should probably get back to at some point and revise! ), and I guess I just needed a change of pace. Moving from vaguely hand-wavey science to fantasy felt right at the time. I wanted a horror vibe for the short story, and demons seemed to fit in well, although I surprised myself in the end with where that story ended up. When I decided to expand the world into a novel, it was only natural that angels, vampires, werewolves and pixies would decide to show their faces. Huh, speaking of short stories, that's another piece of work I should probably take another look at and revise...can you sense a theme? PL: Its nice to know I'm not the only person out there with a TBC mountain. So Heart Blade wasn't your first novel - how long have you been writing, and what would you say is the biggest change in you as a writer? JSM: I started writing 'for real' just over five years ago. My first few attempts were all middle grade novels (for the 8-12 age group), so a lot shorter than your average epic fantasy doorstopper! Eventually I moved up to young adult novels, though I still love my earlier MG work and want to go back and revise some of it now that I've grown as a writer. Getting Heart Blade published was a real eye opener for me; it was my first time working with a professional editor (the wonderful Teresa Edgerton) and it really changed the way I approach the editing and revision process. I think you inevitably mature in terms of craft as long as you keep writing, and also take time to beta and critique other writers' stuff (seriously, critique groups work for a reason – they're a great training tool for all those involved!). But learning to take my work from passable to publication standard has taught me to push myself into a whole other level of writing. What draws you to writing Middle Grade and Young Adult aimed works? As for publishing, it's been an interesting ride. One of the advantages of dealing with a small press like Woodbridge, is that authors are more involved in all steps of the process. I was consulted for cover input, at all stages of pre-publication, etc. I got previews of everything that went into the books, and frequent updates on all of it. I know from friends who have been published with large presses that this isn't always the case, so I'm glad that my first experience in the book world ended up being such a close working relationship with my publisher. PL: What was the submitting process like? Did you use an agent? If not, have you ever thought about going through that process in future? JSM: Heart Blade was a direct submission – my publisher, horror and sci fi author Nathan Hystad, is a writing friend and we often do critiques for each other's work. Nathan had been one of my beta readers for Heart Blade, and when he opened up Woodbridge Press he got in touch to ask if I'd be interested in publication. So I kind of dodged the entire submission process on that one. I have queried agents in the past, though, and once I've finished my current project (something brand new and unrelated to my Blade Hunt Chronicles series), my plan is to get back to querying again. I know plenty of people who have ended up going both routes in their path to publication – agented and unagented – and both have their merits depending on what you want from publishing. But personally, I like the idea of having someone in your corner, looking out for you. PL: That's true - just really helps when that person is the publisher! Okay - obviously getting and giving advice has been a big part of writing for you - what's the best advice, and the worst advice, you've been given? Best was probably: read/listen to all the writing advice, sift through to see what works for you, and disregard the rest. So true! Everyone is different, and different things work for each. There is no 'one size fits all' when it comes to writing advice! Worst, hmm... I can't think of a specific example, but probably every time I'm told I can't do a particular thing when it comes to writing, or that I have to do things a specific way. It immediately makes me want to play with the loopholes and find the exceptions! PL: I sometimes find there's a lot to be said for the creative stimulus of being put in a box and having to look for loopholes - did anything in the Blade Hunt Chronicles come from finding the exceptions? Different tangent - judging from your blog, you seem pretty big on your characters, getting art done for them, introducing them and so on. Where do you get your inspiration for your characters? As for the characters, I love looking at fan art, and I decided it would be fun to get art drawn for some of my main characters. I actually found the artist I use, Corinna Marie, on Tumblr. She did a great job! I'm not really sure what to say in terms of inspiration – I think there are bits of me in a lot of my characters, and bits of other people I know. I have a lot in common, personality-wise, with my character Camille (although I can safely say I'm NOT an immortal succubus). Oh, and I have a soft spot for brown-haired female main characters. I'm a brunette and, back in my 80's teen days, it seemed as if there was a surplus of blonde females in fiction. This is payback, Juliana style! JSM: Argh, don't make me choose!! Camille, of course. Del and Diana in book 1, and Ben and Raze in book 2. But there are things I like about all of them, even my 'bad boy' Jude Raven... As for least in common, probably one of the sentinels, Jordan. He's Ash's cousin (one of my main characters), and although he has angel blood in his veins, he's not particularly nice or angelic. Writing nasty people is hard! Jordan has very little to redeem him, and it's been hard trying not to fall into cliché bully tropes. PL: I had a feeling you'd say Jordan. What do you think are the traps to avoid when it comes to not writing cliche bully tropes? PL: Always comes back to the community! When it comes to other authors' characters, who do you admire - bully boys or otherwise? JSM: I do love a well-written anti-hero, and any sort of 'grey area' and complex character. They're a lot more fun to read about! Reluctant heroes are also great. Give me all those nuances, please! PL: Gimme examples! Name me some of your favourite anti-heroes. And reluctant heroes too. JSM: They might not be exactly anti-heroes, but I have a weakness for accidentally heroic thieves, like Locke Lamora in Scott Lynch's Gentlemen Bastards series, or Kaz, Inej and company in Leigh Bardugo's Six of Crows duology. As for reluctant heroes, one of my favorite arcs is Kaladin's in Words of Radiance, Brandon Sanderson's second Stormlight book. 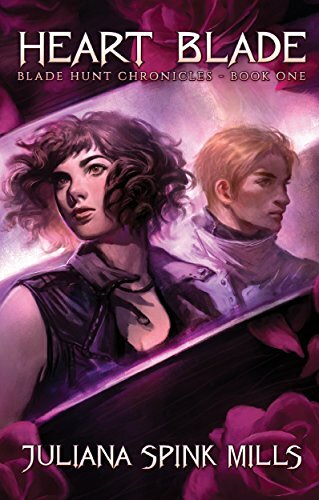 Lila Bard in Victoria Schwab's Shades of Magic trilogy is great, as is Han Alister in Cinda Williams Chima's Seven Realms books (although at first he falls under the thief-hero banner, too). Julia Knight, who also writes as Francis Knight, writes fantastic shades of grey characters. We can all agree that Deadpool is another great example of this sort of character and generally fantastic. 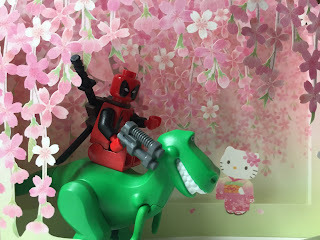 Here's a photo Juliana took of Lego Deadpool riding a dinosaur because why the hell not. PL: High Five on the Locke Lamora love! Shame that events are keeping him from getting the next one out there, I want to know how it ends. You've got book 2 of your own series out at the moment - what can we expect from the rest of the Blade Hunt Chronicles? It's been interesting working on a series – trying to find the balance between writing a self-contained plot for each book with a satisfying ending, and spinning out the longer arcs that span the series. It's certainly a challenge, but a fun one. Hopefully I'll be able to keep up momentum, and not let readers down! Feedback I've had so far from book 2, Night Blade, has been positive, so I'm feeling pretty confidant at the moment. One nice thing about working with multiple books is being able to spend time deepening the core series characters, as well as the worldbuilding. With a standalone book, you're constantly treading a fine line between not enough info and throwing everything but the kitchen sink at the page. With a series, you can take your time, and add more to the world with each book. PL: All things are better with Yorkshire - well, all things but beach holidays. Very well, I shan't pry too much. But what is the one thing you're proudest of with Night Blade and think readers will love most? JSM: One of the main plotlines in Night Blade is a heist, and I had a blast writing it. I'd been wanting to try my hand at a heist story for a while, and it was every bit as fun to do as I'd imagined. Tricky, though, trying to get all the elements right, but I really like the way it all turned out. I hope readers will enjoy it, too! Another fun part to write was the ballroom scene, swishy dresses, tuxes and all. But all in all, I think the heist sequence is what I'm proudest of. So if heists, ballrooms, demons and nuanced heroes sound your thing, Juliana Spink Mills has your back. Night Blade, the second book of the Blade Hunt Chronicles is out now, and is available at Amazon US and UK. To read more by Juliana, visit her website at https://jspinkmills.com/. Juliana does her own Lego Deadpool photos but inexplicably does not have a website dedicated to it. Yet.